Chichicastenango, located about 140 km and 2-3 hours drive northwest of Guatemala City, is home to what is surely the most colorful native market in North and Central America, perhaps in all the Americas. Market days are Sundays and Thursdays, and draw not only the K'iche' Maya of the surrounding region, but vendors from all over Guatemala, representing many of Guatemala's linguistic groups such as Mam, Ixil, Kaqchikel and others, each hawking his or her products in a riotous cacophony of color, dialects and costumes, smoke, and smells. Vendors begin setting up portable booths in the main plaza and adjacent streets of "Chichi" the night before and set-up continues in the early daylight hours. Cohetes (homemade rockets) carrying aloft loud bombas (firecrackers) commence early in the morning and continue sporadically through the day, adding the smell of fireworks to the incense burned in copious quantities on the steps and in the nave of the 400-year old church of Santo Tomás. Although it is not immediately obvious to the tourist newcomer, the market is highly organized, with vendors of specific goods occupying traditional sites in the market area. 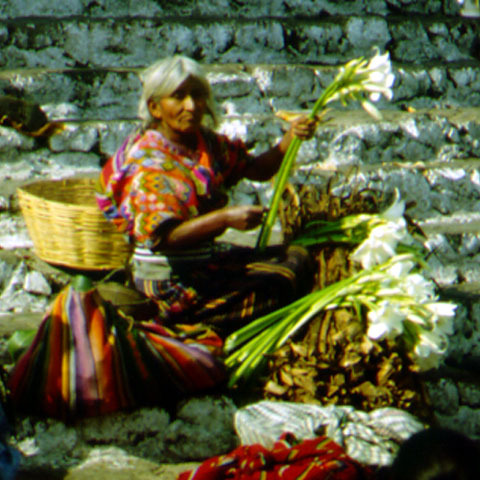 The photo at the beginning of this page shows flower vendors on the steps of the church [5/94]. Here's a close-up of a Maya woman in her favorite spot on the steps [5/93]. 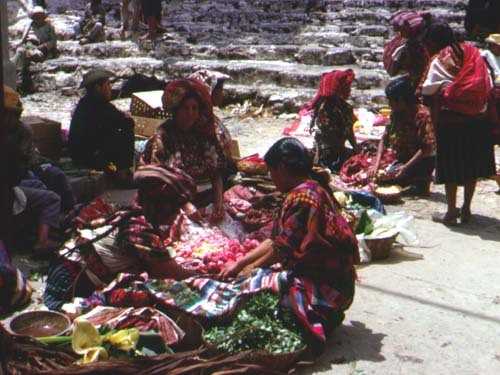 The fruit and vegetable sellers have their traditional area, as do the sellers of pottery, wooden boxes, condiments and medicinal plants, candles, pom and copal (traditional incense), cal (lime for preparing tortillas) and grindstones, pigs and chickens, machetes and other tools, etc. In the central part of the market plaza are comedores (small eateries, in which most tourists would be well-advised not to dine!). In Chichi one can see traje, that is, beautiful traditional native costumes, from all over Guatemala. Those knowledgeable of the textiles can tell where the wearers are from, because many of the costumes are village-specific or group-specific. 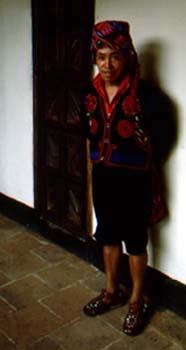 For example, look at Juana, a stunningly-dressed Ixil woman from Nebaj, who has come down from her town in the high Altos Cuchumatanes mountains to sell her wares to tourists at Chichi [8/86]. And here we have a man from Nahualá, another Quiché-speaking town, but with different dress customs. He wears a wool kilt, traditional to Nahualá, instead of pants [8/86]. He has likely come to sell and to do some shopping before returning to his hometown. 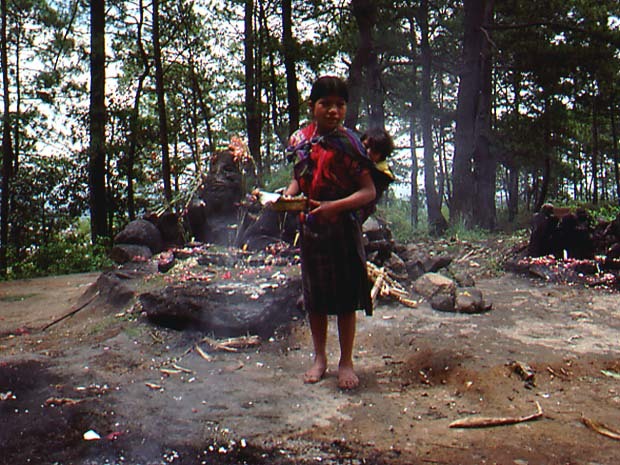 While many Mayan men, especially those from towns in the central part of Guatemala, have forsaken their traditional dress for cheaper and practical western-style clothing, many men of Nahualá and Sololá continue to wear traje. 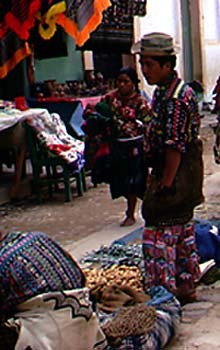 This vendor is from Sololá or one of its related aldeas (villages), as shown by his striped shirt and pants worn with the rodillera (wool wrap-around worn like a skirt, but over the pants) [8/69]. 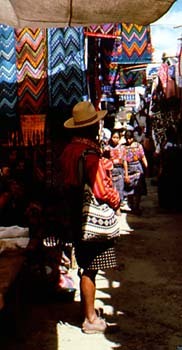 The woman in the background is from Chichi, as indicated by the sunburst design in the collar of her huipil (Mayan blouse, generally formed from a rectangle of cloth, with a head hole cut in the center, stitched up at the sides; pronounced "we-peel"). Here's another shot of several Chichi women showing the beautiful work in their huipiles, which are made of cloth woven on a backstrap loom, and heavily decorated by hand [8/69]. 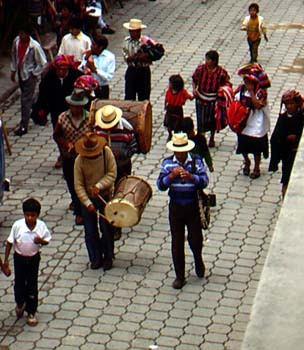 The Indians of Chichicastenango are K'iche' Maya, the largest Mayan linguistic group in Guatemala. Men of Chichi refer to themselves as Maxeños (pronounced with the Mayan "x", which is a "sh" sound, i.e., "Mah-shay-nyos"). Here Tomás is dressed in the full traje of a Maxeño, one of the most elegant of all Guatemalan costumes. Other sights to see in Chichi include religious processions, native musicians in the streets, carvers of masks used in traditional dances, antique and relic shops, the Popul Vuh Museum of Mayan artifacts, the colorful city cemetery, and more. Those who explore a bit may visit an ancient stone idol. This idol is still in use, and offerings of flowers, candles, incense and aguardiente (local sugar cane rum) are very evident. Visitors to the idol should approach in respectful quiet, and stay well back if costumbre (ceremonial ritual) is being performed. 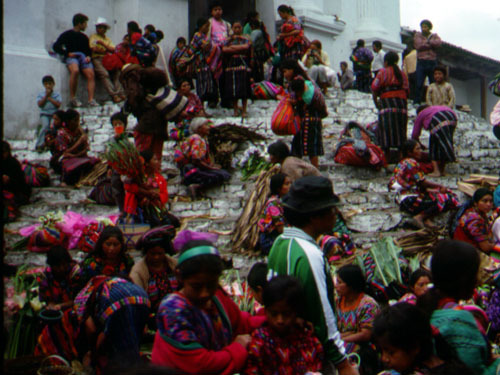 In 1969, the Chichi market was largely contained within the central plaza, and the foreigner might wander about seeing only a handful of other tourists. But Chichi has been "discovered" and great numbers of tourists now visit, leading to expansion of the market into all the side streets for a block or so from the plaza. Unfortunately not all foreign visitors are respectful of the indigenous people and their customs. Tourists visiting the church should enter through the side doors, and not use the front entry. Tourists should avoid pushing too close to or otherwise interfering with any religious activities. Some indigenous people do not mind being photographed, especially from a distance. But others do not wish to be photographed, and certainly resent having cameras thrust in their faces. These are dignified people, not "objects of curiosity". People who indicate that they do not wish to be photographed should be left in peace. There is little outright begging in Chichi, except by a few unfortunate souls with crippled limbs or other afflictions, to whom the tourist can be generous with a good heart. However, some children or drunks may also ask for money, and this is not to be encouraged. Also discouraged is the practice of giving people money for the right to photograph them. For an adventure of a totally different nature, click here: Galápagos Islands cruise. Comments or enquiries may be e-mailed to: rfinch@tntech.edu. Photos on this website by Janie and Ric Finch, copyrighted.